Fez is famous for its ceramics. 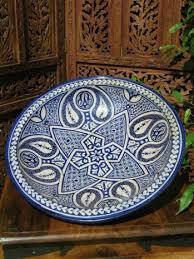 Artfully painted in blue and green, plates, bowls, jugs, tagines and even bathroom basins can be found everywhere. Look out for the slightly greyer clay from Safi: the pure white is more fragile and will chip easily. The tagines (conical-lidded cooking pots) can be highly decorative, some with pewter wirework on them. But these ones are for serving or decoration rather than for cooking. If you want to use a tagine in or on the stove, go for a terracotta one. What about a mosaic table or even a fountain for your garden patio? Large mosaic items can easily be exported. Colourful carpets and rugs abound. Some are antiques, some fairly old, and some brand new. The older ones, and the better quality new ones, will have been made using vegetable dyes and their colours are softer on the eye. 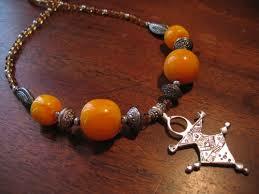 The good ones are handmade by women in the mountains of the High and Middle Atlas. 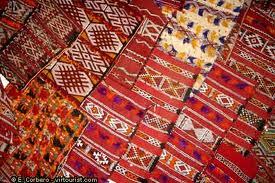 Handiras can be found in carpet shops. These are cloaks made by women for their daughters’ wedding. Some have a shaggy pile on one side to shrug off snow; some have silver sequins as decoration. Handiras make wonderful throws, rugs or wall-hangings. 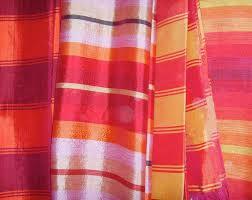 The jewel colours of bed throws and scarves are dazzling and you’ll see these everywhere. You might be told that the fabric is made from the silk of aloe cactus. This is a great story, but isn’t true. It’s made from rayon from China. But no matter, it’s pretty and looks wonderful. Watching the weavers at work on the looms is interesting. You can order exactly what you want and it will be yours within a couple of days. Embroidery on crisp white linen adds elegance to your dining table. You can visit the showrooms and watch the women at work. Prices depend on the amount of work in the piece. Basins, trays and teapots fill the tiny shops in the medinas. 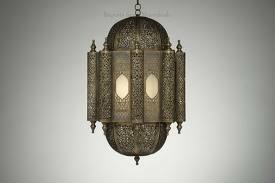 There are pierced metal lanterns and lamps, too, that look glowingly beautiful with a candle or bulb inside. Another well-known product of Morocco is leather, and a trip to the tanneries is usually on the agenda. In this area, you’ll find leather shops selling everything from babouches (pointy-toed slippers) to book covers, handbags to hats, jackets to purses. You can have clothing made to measure within a couple of days. Some excellent antiques can be found at specialist shops. 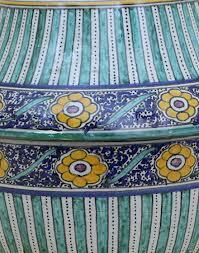 Look out for ceramics such as bowls or green-glazed oil lamps; intricately embroidered wedding belts, caftans, fragments of embroidery from Fez or Rabat, jewellery, brass hammam bowls and the khamsa, or Hand of Fatima, some with the Star of David on them. Moroccan women go for bright yellow gold jewellery, but most likely you’ll be more interested in silver which is sold by weight. 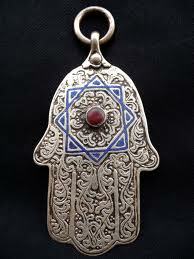 Costume jewellery includes earrings, necklaces and bracelets, some coral, turquoise and amber beads, and the Hand of Fatima to ward off the evil eye. Antique shops have seriously good pieces if you’re looking to invest. There’s a vast array of tantalising spices in some medina shops, including Moroccan saffron. If you enjoy Moroccan food, you might like to take home some ras al-hanout, a mixture of a large number of spicy ingredients including mace flowers and dried rose petals which is ground to order. 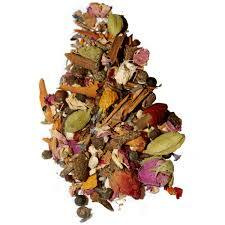 It can be stirred into tagines, used in marinades or sprinkled over chicken kebabs. 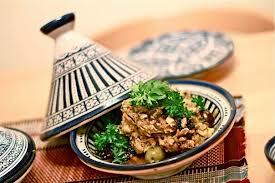 Olives and preserved lemons travel well, too, and are essential ingredients in Moroccan cuisine. It is expected that you will bargain. The first price you’re given will be way too high. As a general rule, start off at half that and work up gradually until you reach a point where you and the shopkeeper are both happy. The vendor might tell you that he won’t be able to feed his family at that price, but rest assured that he’ll never sell you something at a loss. Remember that if you are happy with what you’ve paid, then it’s the right price. Don’t bargain for food in the market or for really cheap items. Rabat – is it worth the trip?